SALE Starting at $2,899 More Finishes. Same Price. SALE Starting at $3,099 More Finishes. Same Price. Round dining tables are the ideal dinner conversation table – everyone can see everyone else. Whether it has legs or a shapely pedestal base, our round tables are statement pieces. Shop the Bassett line of dining furniture to find the perfect one for your decor. Or, take advantage of our custom program and add your own personal flair. With a myriad of finish and color options, you can custom design the round dining table you’ve been dreaming of. Whichever way you choose to go, you’ll get the three things Bassett is best known for; style, fine construction and most of all, value that is beyond compare. Featuring solid, Appalachian grown maple lumber, your new Bench*Made round table will have guests talking. 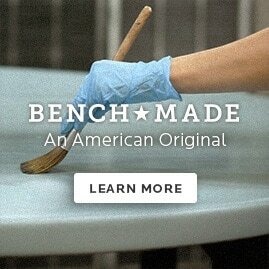 The Bench*Made line of artisan, handcrafted round tables and dining furniture is made in Bassett, Virginia. Created one piece at a time by expert furniture makers, each table is custom made and assembled by hand. There are no assembly lines anywhere at our Bassett, Virginia workshop. Each piece is made with painstaking attention to detail and to your desired specifications. Wood is sourced from the Appalachian region of the United States and Bassett replenishes what we use, planting two trees for every table we sell. Find out why Bassett Furniture has been the preeminent name in fine furniture for over 100 years by visiting a Bassett showroom near you. Shop from our extensive collection of round tables, dining and living room furniture, rugs and more. Use our custom design program to personalize your new furniture or take advantage of artisan workmanship and hand-crafted detail of our Bench*Made line of American made furniture. Either way, your furniture purchase is backed by a century long reputation for quality and value.